Capt. 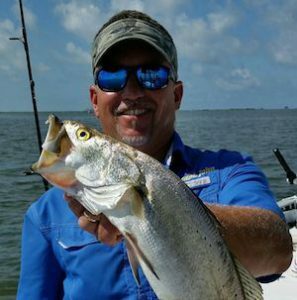 John Chauvin is a fun, knowledgeable and experienced fishing guide who enjoys spending time on the water giving group fishing charters. Capt. John has been guiding Inshore and Coastal Fishing Charters in Grand Isle, Louisiana for over 30 years. As a boy, he started fishing with his father, who was a teacher and a very avid fisherman. His father taught him many techniques on how to target and catch fish. As John got older, his father bought him his first boat. Every weekend and all summer long, John would navigate the bayous, bays and marshes catching various species of fish. His favorites were speckled trout and redfish. Through the years John has fished with many people, and in doing so he was able to observe and learn different styles of fishing. He learned coastal and offshore fishing tactics from some of the best fishermen in south Louisiana. Today, John enjoys using all of the knowledge he has gained throughout his life to give his clients the very best opportunity at catching fish.